This Is My Faster! : How Did I Get Here? I'm trying to figure out where everything went wrong. What changed (and when did it change) to cause me to dread running? There was a period when I would be so upset if weather or faulty alarm clocks forced me to miss my morning run. Now if I wake up and it even looks like it might rain I'm like "Oh Thank God!" and go right back to sleep. On Tuesday morning I forced myself to get up (the weather app failed me) and was ready to go, dressed in the new running gear I got for my birthday, and immediately regretted it once I walked into the humid air outside. But I was already up so I figured I would go for a short run anyway. I started on my usual 1/2 mile warm-up walk... which led to a 1 mile warm-up walk... which led me right back to my front door so I went inside. In an attempt to not feel like a complete bum I decided to workout on my air climber. But about 100 steps into that I gave up the pipe dream and watched the rest of The Mindy Show while using my air climber to prop up my phone. I don't know what happened. I'm supposed to LOVE running. I mean, I still do. Right? It's complicated. Running has been my everything for the past three years. And apart from my family and like five four of my friends (and wine) running is my favorite. It has been a struggle recently, not just to find the motivation to run, but also to speed up. My goal to consistently run a 10min/mile pace seems like a joke now. If I'm actually able to just consistently run period I'll be happy. Well... happier. I started looking at my diet to see where I could improve in that area as well, but honestly my diet isn't horrible. Perhaps the waffle fries from Chick-fil-A weren't the best choice for dinner last night. Nor are the Sweet Chili Doritos I just happen to be snacking on right now. But other than that my diet is great. So since the diet is fine I decided to look at my sleeping habits. But according to Garmin I get enough sleep. And when I'm not up late binge watching shows on Hulu I actually feel quiet rested. Can I just say that this is the worst time to be having this crisis? I have a half marathon on Sunday (yes, as in three days from now!). And it's a destination race. I really don't want to be using up my airline miles for a run that I'm going to feel half hearted about. Granted the race is in the happiest place on earth (no, not Disney... my happy place - Chicago) so that should at least help me get a bit excited. 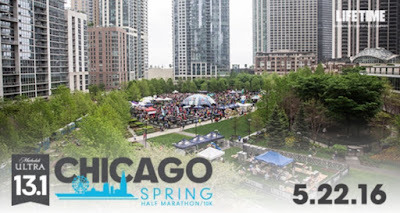 But to be honest, right now I'm more excited about going to Chicago than I am about running a race in Chicago. Is anyone else running the Michelob Ultra Chicago Half Marathon this weekend? I would say it's probably normal to feel this way! Everyone gets burned out sometimes. Mayne it's a different goal/focus that you need now or for a little bit. Good luck in Chicago! !